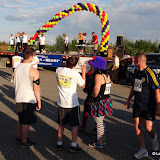 I had such a great time last night running the 10K Midnight Sun Run. I did the race for 59 minutes and some seconds. There were at least 3500 registered runners and walkers and I've seen a lot of people that I have not seen for a long time but most of them are just cheering on the side of the road and having a good time. It was a great and fun night and the weather was awesome too. Hope you're not too tired today. WOW - I'm so proud of and a little envious of you. Congratulations!